The Beltrac® Contempo Pair-Pack includes 2 crowd control stanchions one 7"x11" sign frame and two signs, one reading "Please Wait Here" and the other "Enter." These posts add style and elegance to waiting lines and queue systems. The continuous steel tube provides superior strength and rigidity to withstand the most extreme environments and completely encloses the retractable belt mechanism to protect it from abuse and the elements. The graceful 12.5” curved base belies a solid foundation of 18 lb. cast-iron that offers best-in-class stability and longevity. Advanced Retractable Belt Mechanism • Our unique, centrifugal belt-braking system ensures a slow and safe retraction. • Belt mechanism is quickly and easily field-replaceable. • Belt end connects to all major manufacturers’ posts. Weighted steel stanchion base has superior stability, and the factory-applied, slotted rubberized base protects flooring and promotes air flow, allowing wet floors to dry quickly. 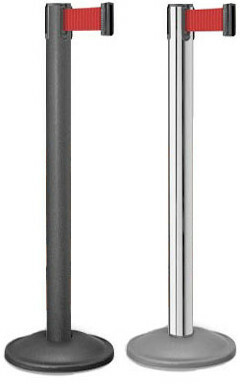 The premium barrier post remains the best available and has the original 4-way connection, allowing a simultaneous connection of up to 4 belts or accessories. The one-piece post construction provides superior strength. (Post can receive all major manufacturers' belts.) These Contempo Pair-Packs - in four finish choices - reduce shipping costs by packaging posts for maximum efficiency. Posts shipped unassembled. Warranty is 5 years on posts and 2 years on the mechanism. Many belt colors available. Contempo 2 Post Pack crowd control stanchions add style and elegance to waiting lines and queue systems. Continuous steel tube provides superior strength and rigidity.